Protests in Venezuela continued over the weekend following President Nicolas Maduro’s refusal to offer concessions in talks with the opposition. 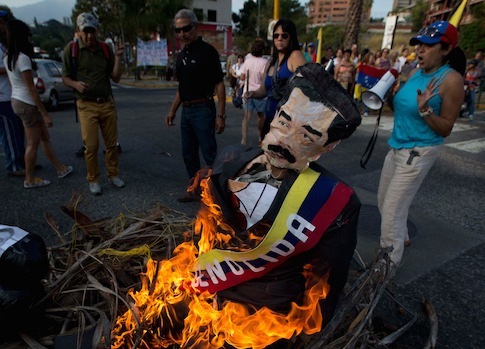 Masked protesters burned effigies of Maduro and used petrol bombs as police sprayed them with tear gas and water cannons. Many of the protesters are peaceful but some have resorted to violence. The unrest has resulted in about 40 deaths, which the opposition blames on state security forces and pro-government militias known as "colectivos." Some U.S. lawmakers have pressed for sanctions against the government in response. "There are many who have already died and it's for them that we're here," one protester told the BBC. "They're not going to have an Easter again, nor carnival." Recent talks between Maduro and the opposition yielded few concrete results. Opposition leaders say the mismanagement of Maduro and his predecessor Hugo Chavez, the late strongman who ruled Venezuela for 14 years, has culminated in soaring crime rates, rampant inflation, and shortages of more than one in four basic goods. Two time opposition presidential candidate Henrique Capriles blasted Maduro at the talks for failing to address the country’s problems and excluding the opposition from governance. Maduro narrowly beat Capriles in elections last April, but the ruling Socialist Party controls all of the country’s institutions. National Assembly President Diosdado Cabello, a member of Maduro’s party, tweeted that Capriles was a "fascist murderer" as he spoke. "How are you going to ask for the country to accept you when you call them fascists and threaten them?" Capriles said. "They’re not going to respect you. And it’s very difficult to govern a country with half of it against you." The opposition demands that Maduro release jailed protesters and leaders such as Leopoldo Lopez. Maduro has said the talks are not about "negotiations" or "deals" but simply facilitating dialogue. Roger Noriega, former assistant secretary of state for Western Hemisphere affairs during the George W. Bush administration, said in an interview that he recently met with some university students who participated in the Venezuela protests. Student protesters have declined to join the more moderate opposition leaders at the talks. "They’re really sincere young people who see that the future holds very little for them," Noriega said. "These inconsequential talks, while the government continues to crack down on them, are not going to satisfy those people." Sen. Marco Rubio (R., Fla.) has continued to push for U.S. sanctions against human rights abusers in Venezuela. Both the House and Senate have so far passed resolutions condemning violence used against protesters. Rubio’s office is reportedly working on a list of Venezuelan government officials and private citizens who could be sanctioned with U.S. visa bans and asset freezes. Venezuelans with close ties to the government have been known to frequent South Florida’s beaches on the weekend and start U.S. businesses. Sen. Bill Nelson (D., Fla.) recently backed Rubio’s call for sanctions at an event in Doral, Fla., an area populated by many Venezuelan-Americans. "There is bipartisan Democrat and Republican consensus that we’re on the side of the Venezuelan people," Rubio said. The State Department did not respond to a request for comment by press time. Officials have previously said they would consider sanctions but are willing to give the talks a chance to work. Noriega described U.S. policy toward Venezuela as "basically a liberty vs. stability debate." "The folks in the bipartisan core in Congress say that the United States should be on the side of folks that want to bring about meaningful change in the country against a regime that is clearly undemocratic and forfeiting legitimacy because of the use of force," he said. "You’re going to need to have significant change there to get beyond these problems." The State Department has adopted a more cautious approach, expressing concerns about the short-term effects of the unrest on the economy and stability in Venezuela. Officials note that other South American nations helped broker the dialogue. "They have a strong argument," Noriega said. "The problem is the people sponsoring the dialogue have been saying for the last 15 years that they want democracy in Venezuela, but they have stood by and done nothing as democracy was dismantled." "How much longer do people have to wait to get a better government in Venezuela? The answer I guess is a few more weeks."